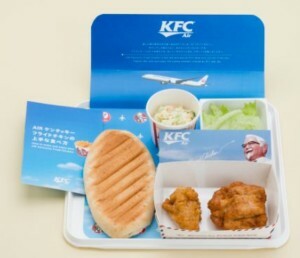 During this period, customers traveling in Premium Economy and Economy Class on JAL from Narita to New York, Boston, Chicago, Los Angeles, San Diego*, London, Paris and Frankfurt, will be served KFC’s Original Recipe two-piece chicken meal during the second meal service. I could not comprehend the move… KFC? Other folks go and try to get top-flight restaurants to do these sorts of things. what am i missing? how can a fried product possibly be reheated into something tasty? and, is it going to make the planes smell like a KFC? that would be terrible…. but KFC is very popular overseas, and Americans love fast food! The packaging looks rather elegant considering the product, hahaha. Is KFC REALLY that big of a commodity for travelers coming from Japan to the USA? Its surprising how far fried chicken travels around the world, and how its sought after. It doesn’t make me really WANT to hop on a JAL flight though. Now if it were an In-N-Out Double Double…i might be more tempted. Lol awesome. When travelling for 2-3 weeks sometimes you crave something from home. Both Cambodia and Poland had pretty good KFC.